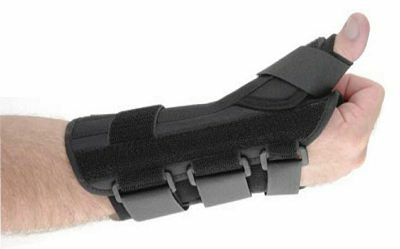 The Formfit Thumb Spica aids in restricting the wrist and thumb motion providing immobilization and protection for patients suffering from tendonitis (e.g. DeQuervain’s Tendonitis), specific soft tissue injuries. This also includes mild to moderate sprains and strains and Gamekeeper’s Thumb. It is also beneficial for post-cast healing. The material is lightweight and breathable giving a contour fit to make this product an excellent choice for healing. 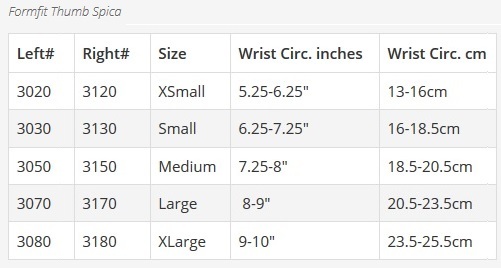 OrthoTape.com is an authorized dealer of these products and guarantee its authenticity and craftsmanship. Unlike eBay and Amazon that sell either a knock-off brand or an out of date item. We get our products directly from the manufacturer as an authorized dealer. We also back our products with great customer service. You always have someone you can call! 800-580-9887 M-F 9:30 – 5 PM EST.